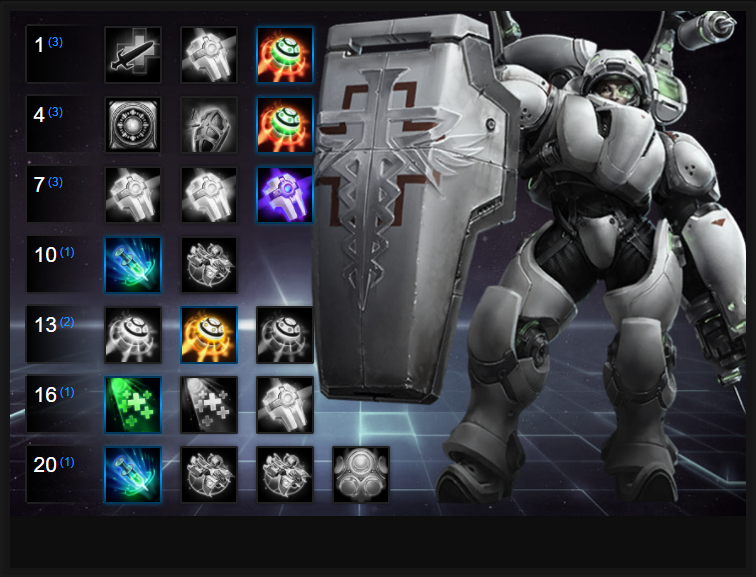 In this Lt. Morales Build Guide, we provide an overview of her strengths, abilities, talents and matchups. Lt. Morales is a powerful support Hero that's capable of protecting allies, healing a single target for large amounts but, also providing some utility through her grenade and Dropship. Her Displacement Grenade is invaluable at peeling for your allies, Safeguard fantastic for avoiding a spike and her Healing Beam can keep most targets alive when focused. Although she lacks AOE healing potential, she makes up for this later game with talents that bolster her single target output, or which allow her to cast Safeguard twice. Lt. Morales has no mobility and her damage is also very poor. On that basis she relies almost entirely on a strong front line to protect her. If she gets it, she's incredibly difficult to bring down and she can comfortably heal to her heart's content. Cadeceus Reactor (Trait) - Lt. Morales' Trait allows her to regenerate health when she's channeling her Healing Beam. The value might not seem high at 2% of her maximum health, but it is rapid and allows her to mitigate a fair amount of incoming damage. If you've taken damage, you should still retreat (this won't help you survive against burst), but your Trait is the quickest means of healing without tapping a Fountain. Healing Beam (Q) - Healing Beam is your primary and only means of healing your allies. The healing amount is high, but you can only heal a single target at any one time. You also need to use the ability again to switch targets or to cancel it. Be sure to focus on an ally who is under heavy fire, or soon to be, because it heals in ticks. If you want to cancel the beam, just target yourself so that you don't waste your mana. Be aware that the range is limited on Healing Beam, so if you're trying to follow an ally who's diving deep, you'll put yourself in harms way. Safeguard (W) - As your only means of mitigating damage from enemies, Safeguard is invaluable. On a lengthy cooldown at 15 seconds, it reduces all incoming damage from all sources by 25% (by providing 25 armor). This is fairly significant and when combined with your healing beam, allows you to sustain someone much easier. Despite its potency, it doesn't last long and should only be used to prevent a spike against an ally, or when they're diving deep to attack an enemy. It should be noted that you can cast Safeguard on yourself which is often mandatory when you're under attack from the likes of Illidan or Greymane. Displacement Grenade (E) - Your only form of crowd control, Displacement Grenade is invaluable at disrupting enemies or killing someone who is running away. It's knock back is amazing at preventing an objective capture, but it's also incredibly useful for allowing you to escape. Don't waste it and be sure to use it to peel any allies who are being focused. It's important to note that your grenade can travel through enemies, and can be manually detonated so you can accurately choose when to push someone away. Stim Drone (Heroic) - Stim Drone is amazing if you're with a particularly melee or basic attack (ranged) heavy composition. Giving 75% attack speed and 25% movement speed to Illidan or The Butcher is outrageous and allows them to blow up almost anyone. It also works really well with ranged Heroes such as Tychus or Raynor. Be aware that Stim Drone has a very short cast time and you can be interrupted before it's activated. Medivac Dropship (Heroic) - It isn't a common pick, but as Battlegrounds get larger Medivac still has lots of value. Although the craft can be destroyed, it's often a gaurenteed escape for Morales and allows your team to snowball fairly easily. Wiped the enemy team? Zip to a boss. Need to quickly take a structure? Hop in the Dropship. Need to get everyone quickly to an Objective? Call your Medivac. Lt. Morales relies heavily on her Grenade, so taking Clear! to reduce its cooldown by 4 seconds and increase its radius by 25% is significant. Although the Talent is a Quest, requiring you to hit 30 Heroes in total, it's incredibly easy to complete and takes around 10 minutes if you aren't rushing to finish it. Building on your Grenade Talent above, Blast Shield provides Lt. Morales with a stacking shield every time she lands Displacement Grenade. Stacking up to 5 times, Blast Shield offers her a 40% shield based on her maximum health. That's an enormous amount of easily obtained shielding, that will significantly reduce the impact of burst damage against you. Safeguard only lasts 3 seconds, which is a short amount of time when someone is under heavy fire. Taking Prolonged Safeguard increases this to 4.5 seconds, allowing your ally to withstand much more punishment for longer. Purely because of the potential damage bonus it offers, whether you're in a melee or ranged heavy composition, casting Stim Drone on your highest damaging hero will ensure they can cause huge problems near instantly. Whether it's Valla, Butcher, Varian - it doesn't matter as long as they're basic attack based. Variable: An incredibly strong Heroic, Medivac Dropship allows Lt. Morales to call down a ship. Allies can then step inside and she can command it to touch down anywhere she wishes. It's incredibly useful at quickly moving your entire team or a small group around the map and considering the size of maps in Heroes Of The Storm have continued to grow in size, its use is even more important. Particularly of value on very large Battlegrounds. Allowing Lt. Morales to reduce the damage of Heroes struck by her Displacement Grenade by 30%, System Shock is an amazing tool when she needs to defend herself, or mitigate incoming damage against an ally. It's especially potent when paired with Safeguard as if you land your grenade against an enemy Hero, while shielding your team mate, they'll effectively have 55% mitigation (-30% from their opponent, and +25% armor from your shield). Extended Care allows Lt. Morales to heal from 30% further away, ensuring that she can heal her team with ease, and never putting herself in harms way. It also makes her very difficult to kill, not only because she's so far from her team, but because she also has shielding from her level 7 Talent. Hyperactivity lowers the cooldown of Stim Drone by 45 seconds, and increases the movement speed of the ally affected by an additional 25%. Used on Heroes such as Illidan, The Butcher or Valla, it allows them to move at frightening speed, while still gaining all the standard benefits of the Heroic. These Hero Threat Levels (1 being lowest threat and 10 being highest threat) are to help you determine which enemy Heroes as Lt. Morales can give you a headache. In all honesty, she can struggle in many 1 on 1 scenarios because outside of her Displacement Grenade she has no mobility, stuns or means of quickly escaping. Even her Trait won't save her as the health regeneration when being burst down. You should do your very best to avoid the below Heroes, or keep them as far away from you as possible. Illidan: His mobility and evades make him a challenge for Lt. Morales. His damage and if he uses an elite will also leave you in trouble. If you miss your grenade, it's as good as over. Murky: His Slime, Safety Bubble, basic attacks and constant harrassment can make life miserable. Nova: Nova loves to target Lt. Morales. If you are not full health and you are alone, you are in jeopardy. Try to always stay near allies and keep your grenade ready to disrupt her. The Butcher: His charge, Lamb to the Slaughter or self heal can rip you up in seconds. Even if you grenade him, a good Butcher will have saved his Lamb to the Slaughter to ensure he can finish you off. Keep your distance! Thrall: If he gets the drop on you with his root, you're going to take huge damage. Fortunately even if you are rooted, you can then Displacement Grenade on him. Just be sure not to miss and if low, remember his Chain Lightning has good range that can finish you off. Valla: Her Vault makes her tough to land your Displacement Grenade and her sustain damage can cause real problems, especially with the extended reach of Hunger Arrow. Fortunately she's squishy so if she gets caught in your grenade, she'll take some damage and it'll buy you time to run. Lunara: Her ranged poke, mobility and Thornwood Vine can make life very difficult for you. She'll regularly prevent your trait from activating and stretch your healing to its limit. This list of tips and tricks are just a handful of things we think will help your Lt. Morales play. We'll continue to add to the list as required and if you have any tips you'd like to share, let us know in the comments below and we'll place them here. 1. Lt. Morales is a pure healer - she really has no means of killing opponents unless they're low health and you can land a perfect grenade. Stay with your allies and heal. Often. 2. Your grenade is your primary means of esaping because it interrupts and knocks back. Use this when you're being chased, just be sure not to miss. 3. All your healing comes from your Healing Beam. You need to use this skill again to change targets and you should do this regularly based on who is taking damage. 4. Safeguard only lasts 3 seconds so you need to ensure you use it just before your team mate is spiked or the moment they are. 5. You can prime Medivac Dropship so that it lands ready. It's incredibly useful to place it near where a team fight will happen so that if you need to escape, your team can run to the Dropship. 6. Lt. Morales is very mana intensive - try to only heal when neccesary and hurry to level 20. 7. Try to always use your Displacement Grenade against key enemy targets to protect your team or to disrupt objectives being interacted with. 8. As Lt. Morales has no real means of escaping if she doesn't have her grenade. It's really important that you position yourself on the edge of any fight so you can retreat quickly. Always be aware of an exit. 9. It's best to have two warriors with Lt. Morales as they can comfortably peel and protect for her.